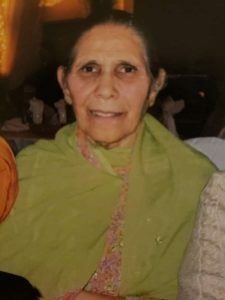 With great sadness and heavy hearts, we announce that Mrs. Charanjit Kaur Johal passed away peacefully on December 12 at the age of 88. Mrs. Johal belonged to Village Salempur Masanda, Jalandhar district, Punjab. She is survived by her husband, daughter and grandchildren. Known to have a heart of gold, Charanjit will be missed dearly by her entire family, her relatives, and any person that ever came to know her. Funeral services for Charanjit will be held at Riverside Funeral Home, 7410 Hopcott Road, Delta, on Tuesday, December 18 at 1 p.m., followed by prayer service at Gurdwara Sahib Brookside, 8365 140th Street. For more information, call 604-507-9159.